Vena II draws on the strengths of the original, a neat and convenient solution to hi-fi sound from vinyl, CD, digital streamers and all playback sources. 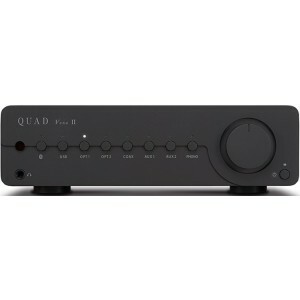 Quad Vena II, building on the strengths of its predecessor, is an exceptionally neat and convenient way to bring true high-fidelity sound to the varied nature of modern music collections – from vinyl and CD to digital streaming and hi-res files – via all manner of playback devices. The Class AB power amp section now has an upgraded power supply, a new 200VA toroidal transformer lying at its heart. This is followed by 2x15000uF reservoir capacity (30000uF in total), helping the amp to maintain firm control of the music whilst enabling excellent dynamic range. Vinyl lovers will appreciate the addition of a phono stage for moving magnet cartridges – a high-quality, low-noise, JFET-based circuit with precise RIAA equalisation – adding to the Vena II’s already formidable format flexibility.